Rushabh Sahare from Nagpur, B.E. - B.Tech Graduate. Rushabh Sahare is Engineer and currently have no work experience. MICROSOFT OFFICE NETWOKING MCSA (WINDOWS SERV.. REDHAT RHEL 7 CCNA DESKTOP ENGINEERING PC ENGINEEARING ASSEMBLE HARDWARE & .. OUTLOOK BACKUP & RES..
are one of expert skill area's of Rushabh Sahare . 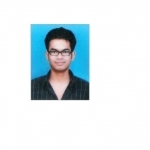 Rushabh Sahare is working in IT Hardware industry.